The international market for machinery used in the poultry slaughter industry is not particularly large and is characterized by only a few major players. Being big has limitations, especially with regard to flexibility and the ability to quickly respond to changes or specific needs in the market. On the contrary, TopKip a small and agile Dutch company is able to react quickly to new market demands. The increasing pressure on poultry processing companies by consumers requesting fresh, chilled poultry meat without the presence of harmful micro-organisms is a constant challenge for poultry-companies. Reacting to this market demand, the TopKip researchers came up with the solution. Despite being a small company, TopKip was able to bring to the market place this unique water-air cooling system, the Combi In-Line Air Chilling System™. The excellent results were internationally recognized and gave the company the ability to quickly establish a name in the market. Meanwhile, the innovative thinking at the company was again put to the test. When the effectiveness and animal-friendliness of the traditionally used water bath stunner was being questioned, the research staff of TopKip succeeded in developing a new stunning concept, The Head only Stunning System™. The birds are secured and stunned via a head sensor device. The amount of necessary current is determined by the resistance of the birds head. The result is a quick and effective anesthesia without stress or other suffering by the animals. Used correctly, the TopKip principles assure consumers that chicken products are of premium quality. Optimum machine speed and product safety are two concepts that have the highest priority at TopKip when developing new equipment. 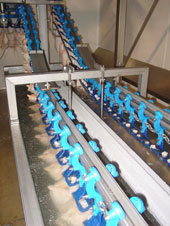 As the producer of the world's only in-line combined water-and-air cooling system for chicken slaughter plants, the highest standards have become an automatic fact of life at TopKip.